Before you know it, you’ll be snacking on this delicious Coconut Almond Spice Granola, so here’s what you’ll need: Kosher Salt, Almond Extract, Coconut Oil, Old-Fashioned Oats, Raw Honey, Brown Sugar, Allspice, Vanilla Bean Paste (or extract if you must), Cinnamon, Cardamom, and 1 cup of Sliced Almonds. Before you start, go ahead and preheat your oven to 350 degrees. 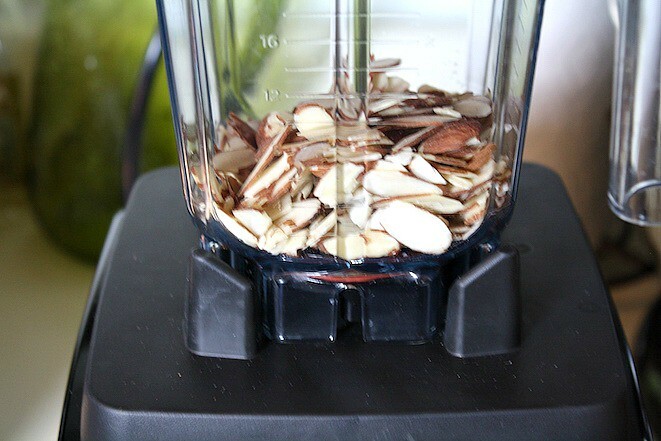 Then add 1/2 cup of your sliced almonds to your high speed blender. Then chop up the almonds so they are finely chopped like this. Transfer these almonds to a bowl, so you can work on the next batch. 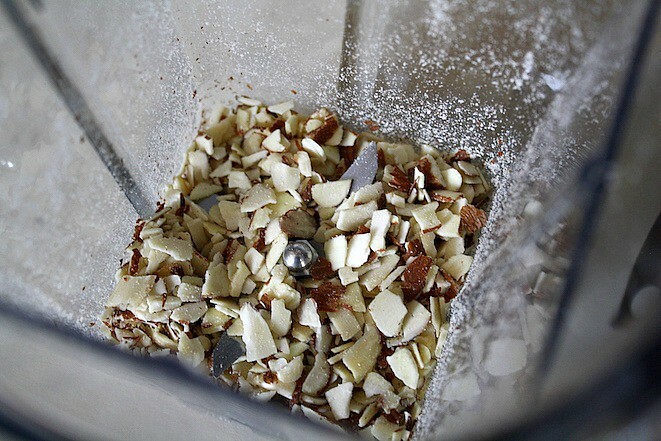 Add the other 1/2 cup of almonds to the empty blender and this time roughly chop them as you see here. Then in a large bowl, add 3 cups of your oats plus both batches of almonds. 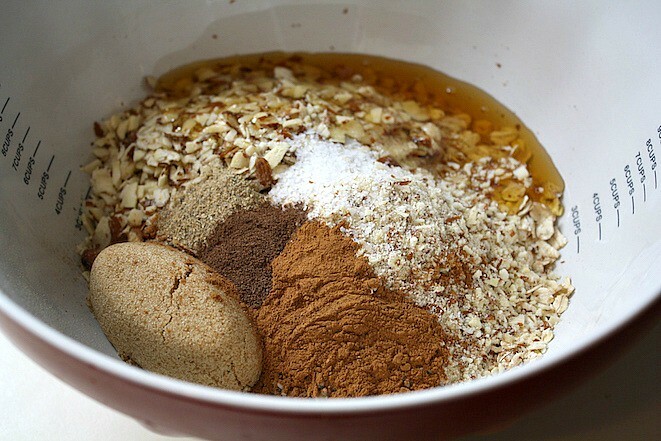 To the oats and almonds, you’ll then add 1/4 cup of brown sugar and about an 1/8 cup of honey. 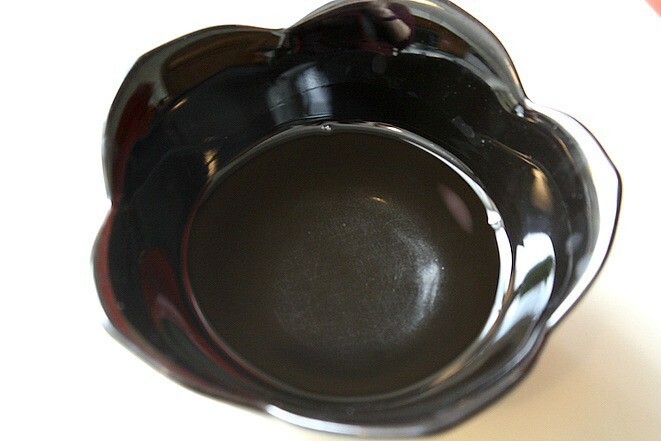 My favorite tip here is to spray the measuring cup with cooking spray, because the honey will slide out more easily. Then add your spices including a teaspoon of salt, cardamom, and allspice plus a tablespoon of cinnamon. Then stir well so the mixture is well combined. 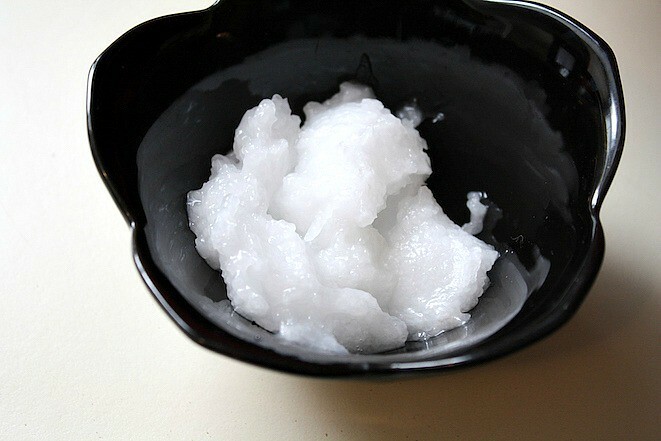 In a small bowl, measure out 3 tablespoons of coconut oil, and you’ll notice that it’s fairly solid. You’ll want the oil to be melted as you see here, so pop it in the microwave for 20-30 seconds until it’s clear. Add a teaspoon of vanilla bean paste and 1/8 teaspoon of almond extract to the coconut oil, and stir to mix well. 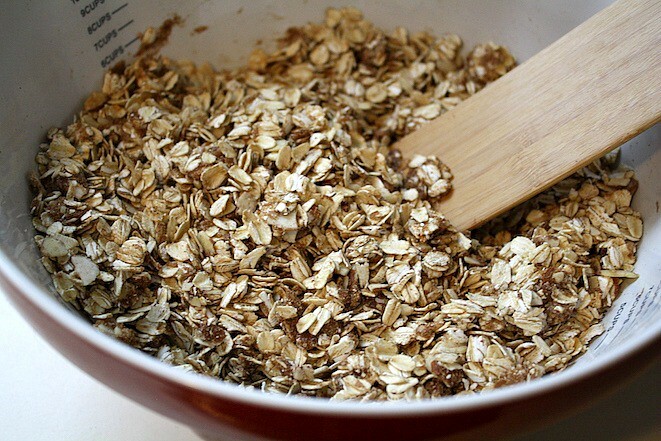 Pour the oil mixture over the oats and then stir it really well so that the mixture is uniform. 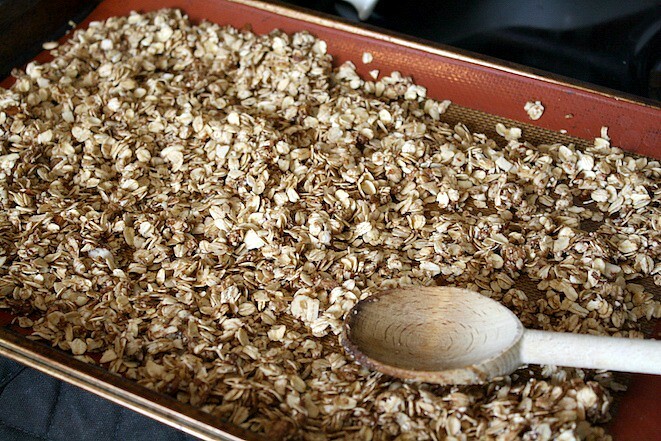 You can pile all of the granola on one baking sheet, but I prefer to use two. 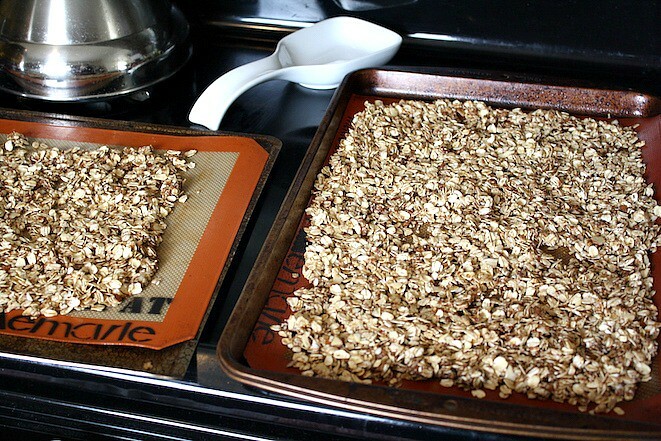 So line two baking sheets with a Silpat and then spread out the granola onto an even layer on both baking sheets. Then bake the granola for about 7 minutes. After 7 minutes, then remove the granola and give it a stir. And if you’re using two baking sheets, swap positions in the oven so they bake evenly. Pop the Coconut Almond Spice Granola back in and bake for another 7 minutes. 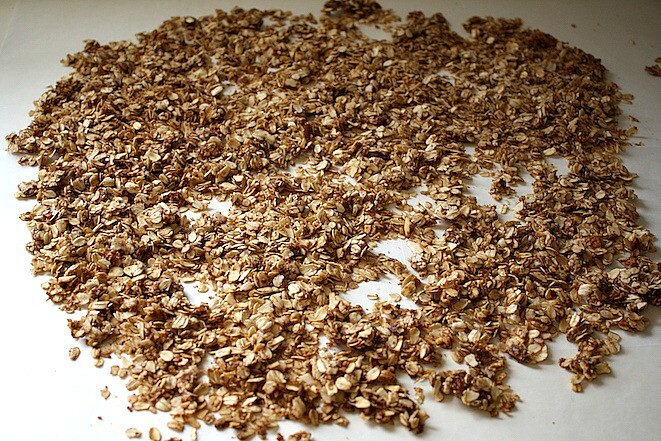 Pick out where you want to cool your granola and then use 2-3 sheets of waxed paper to lay out so the granola doesn’t stick or make a mess. 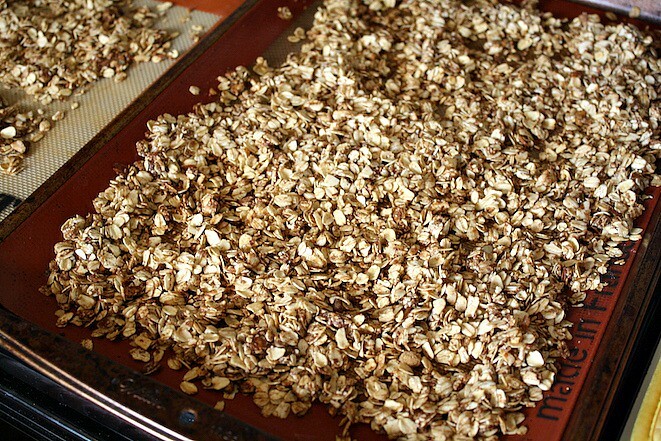 Once the granola is baked, let it sit on the baking sheets for about 5 minutes so it’s slightly cooler to handle. Then transfer the Coconut Almond Spice Granola to the waxed paper and let it sit there in an even layer until completely cool. Once it’s cool, you’re free to enjoy this granola as a snack, meal, topping for smoothie bowls, road trips, and more, so happy granola making!! 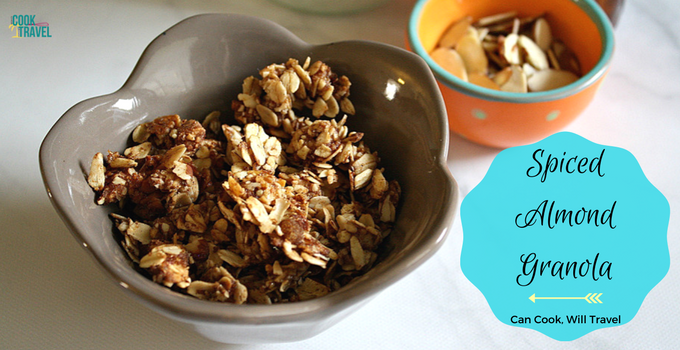 Enjoy this simple granola recipe that is perfect to have on hand for a healthy snack anytime. Preheat your oven to 350 degrees. Start by prepping your almonds. 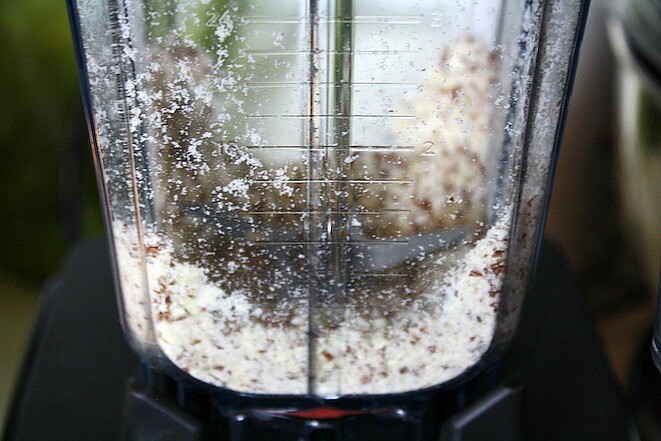 First finely chop 1/2 cup of almonds in a high speed blender, and then empty the blender and roughly chop another 1/2 cup of almonds. 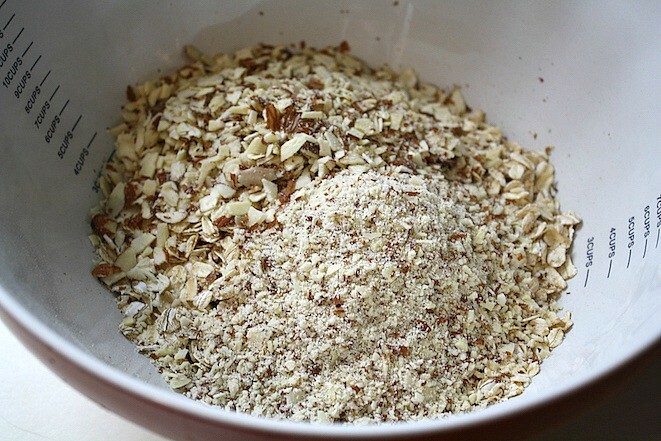 Add the 2 batches of almonds to 3 cups of old-fashioned oats in a large bowl. To the oats add 1/8 cup of brown sugar, 1/8 cup of honey, along with 1 tablespoon of Cinnamon and 1 teaspoon each of cardamom, allspice, and salt. Stir to combine. 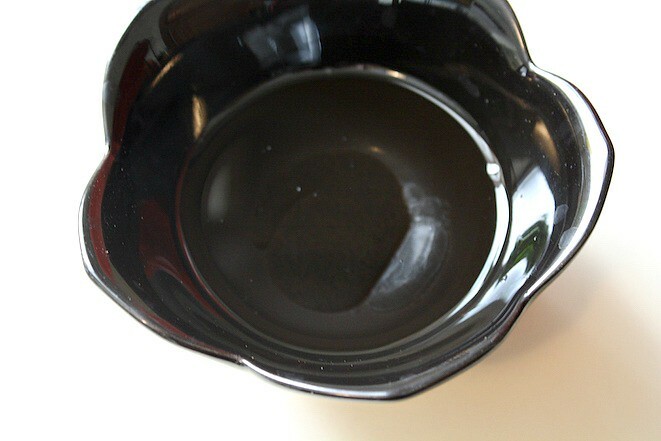 In a small bowl add 3 tablespoons of coconut oil and microwave until the oil has melted. 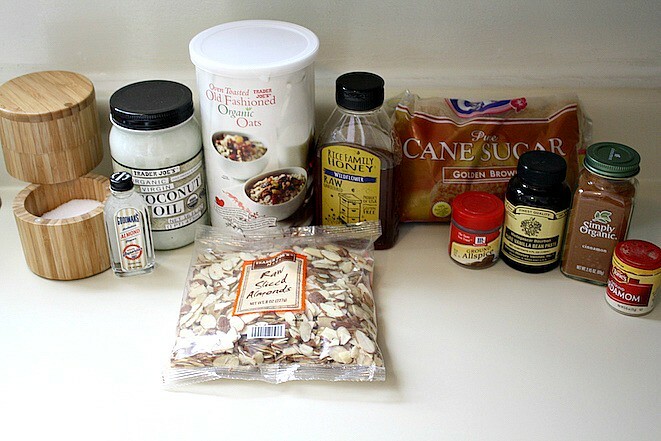 Then add 1 teaspoon of vanilla bean paste and 1/8 teaspoon of almond flavor and whisk to combine. Add the oil to the bowl of oats, and stir so it’s fully combined. Then line 1 or 2 baking sheets with Silpats (I like to use 2 so the granola gets nice and crispy), and spread the granola on each cookie sheet in an even layer. 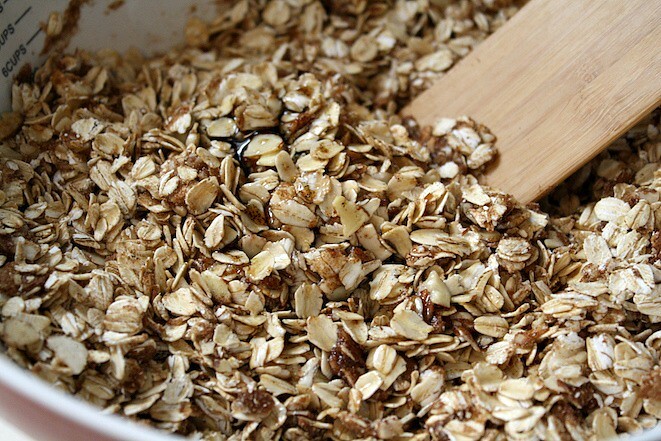 Bake in the oven for 7 minutes, and then stir to toss the granola. Return it to the oven and bake another 7 minutes. Then let the granola sit for 5 minutes. 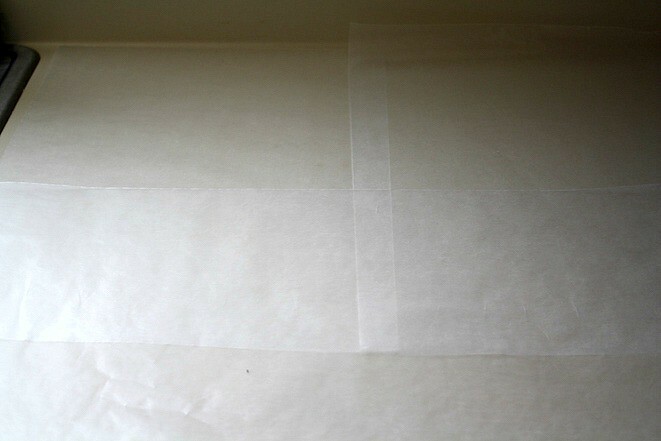 While the granola bakes, line your counter with some waxed paper, and then turn out the granola onto the waxed paper in a single layer and let it cool completely, and then enjoy! Thank you so much will be making this. Looks amazing.